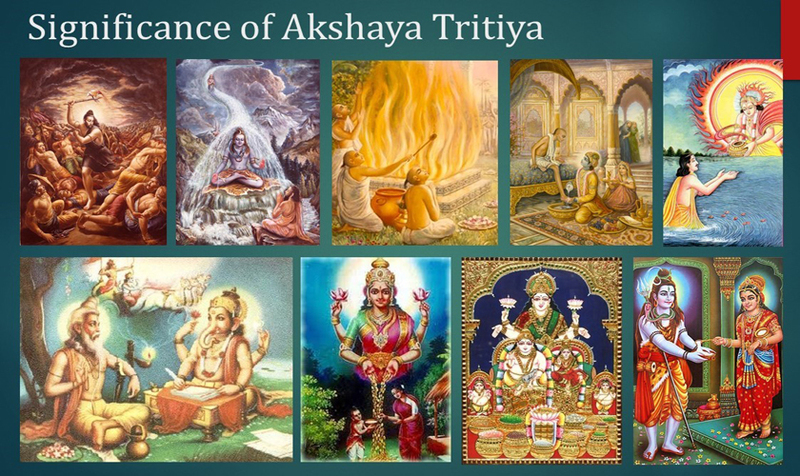 While some facts about Akshaya Tritiya and its significance are well known to all, there are a few more that are least heard of. What is the significance of Akshaya Tritiya? Apart from the rush to purchase gold there are many other reasons why this day is very significant. Some of the commonly known reasons are listed below. We also give you a list of seven least known facts. (9) Goddess Annapoorna Devi appeared on this day. Now, let us know about the least known facts. Simhachalam (Andhra Pradesh) is the abode of Lord Narasimha. The Deity of Lord Narasimha is always covered with sandal paste. On the day of Akshaya Tritiya (which occurs 11 days before Narasimha Jayanti – the appearance day of Lord Narasimha), the sandal paste is removed and abhisheka is performed. This is the only day on which the devotees will get to see the form of the Lord. On the same evening, the Deity is again covered with sandal paste. Every year the Ratha Yatra festival is celebrated at Jagannath Puri. The three chariots of Jagannath (Nandighosha), Baladeva (Taladvaja) and Subhadra (Darpadalana) are newly built every year with the wood of specific trees. The construction of the chariots for Ratha Yatra begins on the day of Akshaya Tritiya. In the temple of Kshira-chora Gopinatha (Remuna, Odisha) the Deities of Madana-mohana, Govinda and Gopinatha are smeared with sandalwood pulp on this auspicious day of Akshaya Tritiya. This tradition is being followed from the time of Sri Madhavendra Puri, one of the acharyas in the Gaudiya Vaishnava Sampradaya, who travelled from Vrindavana to Jagannath Puri on the order of Gopala Deity to collect sandalwood and camphor. On the way back, the Deity of Gopala ordered Madhavendra Puri to grind the sandalwood with camphor and apply it to Gopinatha Deity because the Deity of Gopala and Gopinatha are non-different. This Deity of Gopinatha stole a sweet rice pot for His dear devotee, Madhavendra Puri and hence the name Kshira-chora Gopinatha. In Badrinath, the temples of Gangotri and Yamunotri are closed during winter. On the day of Akshaya Tritiya the shrines re-open for the pilgrims. Kumbakonam, the temple-city, celebrates Garuda-vahana Seva for Vishnu Deities (Perumal) from 12 different temples: Chakrapani, Sarangapani, Varadaraja, Valvil Raman, etc. Garuda, also known as Vainateya (the son of Vinata) is the bird-carrier of Lord Vishnu. He is the king of the birds (Khagendra). In the Vedic literature it is stated that the two wings of Garuda are two divisions of the Sama Veda known (brhat and rathantara). The vibration generated by the flapping of his wings form the basis of Sama Veda mantras. Visit Kumbakonam on the auspicious day of Akshaya Tritiya to have darshan of Dvadasha Garuda Seva. There is a mad-rush for purchasing gold on Akshaya Tritiya. People believe that if they purchase gold on this auspicious day it will never diminish. But did you know that the scriptures recommend Guru Pushya (Pushya Nakshatra falls on Thursday) as the auspicious day for purchase of gold. In 2018, the Guru Pushya yoga is formed only on January 4, September 6 and October 4. Did you know? Srila Prabhupada is the founder-acharya of ISKCON, the International Society for Krishna Consciousness. Before starting ISKCON, Srila Prabhupada incorporated a society in India, called The League of Devotees, at Jhansi on the auspicious day of Akshaya Tritiya (16th May) in the year 1953. Download The Prospectus of The League of Devotees. On the auspicious day of Akshaya Tritiya you can donate towards charitable causes. Click here to donate for Akshaya Annadana Seva.